Imagine having a 7-Eleven in your garage, except without the Slurpee machine. This is how it feels to be the proprietor of a faleoloa. 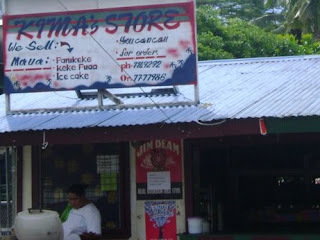 A faleoloa is a small, local, independently owned and operated general store. 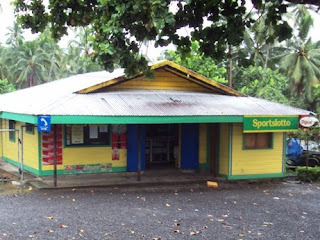 Most faleoloas are an adjunct part of the owner’s house, although there are some small stores in Apia run out of independent structures that we still refer to as faleoloas. Some faleoloas are the actual size of a 7-Eleven, so customers go inside, pick up what they want, and then exit past a cash register. Others are simply a window through which customers point at the things they want. Faleoloas almost always sell candy, potato chips, cigarettes (sometimes you can get them by the pack, but you can almost always buy them individually), soap, curry, and rice. From there, a faleoloa is a little like a new car in the sense that there are a whole lot of add-ons and accessories that help differentiate one from another. Many have their own bakery and offer their clientele bread and panekeke. My host sister, Asolima, is keenly aware of which faleoloas are equipped with freezers, so no matter where we were, she always knew who might have ice cream. Some sell fish’n’chips, some sell Digicel “Top-up” credit, some sell lottery tickets. Most villages have a faleoloa that meets its needs, so it tends to be a crowded market, and it’s difficult for new faleoloas to survive very long. In addition to finding a niche in the market, overhead costs can be high. It’s difficult for many people to regularly make the trip into Apia to keep shelves stocked. Legally, faleoloas are required to be licensed by the government, which also impedes market entry. That said, faleoloa owners tend to be more affluent than the average villager, and faleoloas are essentially the most visible small businesses in the country. I’ve heard stories from village-based volunteers who’ve had many Samoans ask them about helping get a new faleoloa off the ground. It can be difficult to communicate the hardships inherent in starting and maintaining a faleoloa. While we were living in the training village, a member of Phil’s host family, Onosa’i, started a faleoloa out of the back of Phil’s house. It was a modest operation, and it mostly catered to Phil’s family (which was somewhat large) and a few of the surrounding neighbors. One problem he had right off the bat was keeping the store staffed. Onosa’i spent all day every day in that store, save for sleeping late at night and the occasional evenings when Phil would man the window for a couple hours. Onosa’i was raising money for his sons’ school funds, and their education justified the work. His one claim to fame was his homemade doughnuts; they were excellent and popular. He only made them on Sundays, but he would make a killing when he did. In any case, when I went back to visit in January, Onosa’i had already closed his faleoloa. It had only been open for about 2.5 months. He’s quite the entrepreneur though: he made a deal with the faleoloa in the next town over that allows him to sell his doughnuts there on Sunday. And he’s driving a taxi now. So his sons will be all right. I hope you’re well. Faleoloa pictures below. Kima's faleoloa is across the street from my school. They often sell barbecue (as seen in the bottom right), and they're open late. Also, it's owned by Sgt. Greggs from "The Wire". Bus stops and faleoloas often go hand in hand. 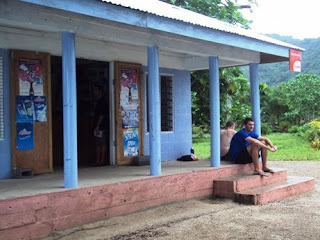 We waited here for the bus that took us back from Falese'ela. 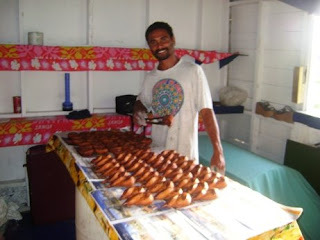 Onosa'i (who Luisa and Lester refer to as Rick Fox) showing off his doughnuts. those doughnuts look awesome!! 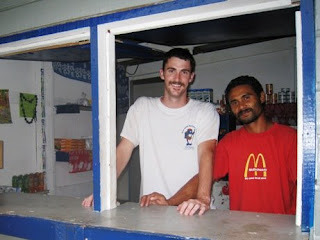 Samoa has changed SO much since my Mum grew up there...but i think the baking has not!! ;) i enjoy your cultural explorations...i'm going to print off a bunch for my parents to read and catch up on Samoa (been almost 20yrs. for my Mum and almost 40 for my palagni Dad)...they're pretty computer illiterate...they may fit in well in one of your computer classes!